Only a couple of metres away is something that has become another hit with those birds wanting to look their best. Let's call it The Powder Room, but between you and me it's just a pile of dusty soil in a sheltered and sunny spot. Here is one of the visitors yesterday, having a whale of a time, thrashing about in the dust. 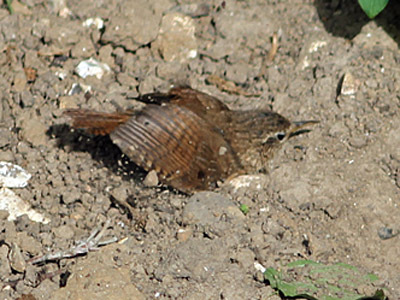 It's of course a Wren, and the activity is known as 'dust bathing' or, more correctly, 'dusting'. 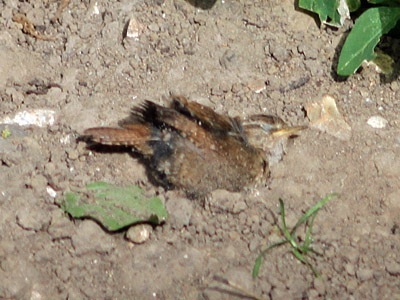 Dusting is where a bird flicks and wallows about in dry, dusty soil, getting the powder deep into its plumage. It is typically a behaviour of desert birds, but in UK gardens the birds you are most likely to see dusting are House Sparrows. It is all thought to be to do with plumage care, the dust helping to clean the feathers of any dry skin, grime and even parasites. 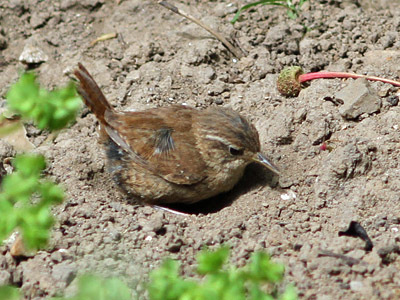 Just look at how much this Wren is enjoying it - it feels SO good! I often talk about filling a garden with greenery to help wildlife, but it just shows that some bare soil has its place too, and it will also be used by some mining bees and sunbathing butterflies. So help wildlife today the easy way by growing nothing in part of your garden. Your Wrens and Sparrows will love you for it.